LocationIn my mech because my sauna wasn't working. 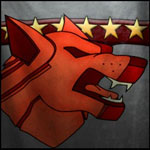 I'm fairly new to MWO and I'm looking for a unit to join. I've been playing Battletech games my whole life. I'm kind of a lore nerd (just a little bit). I'm starting to get to the point where I'm getting two or three kills, get a ~300-500+ score, and survive my matches. I've learned that staying together and being patient are really important to success (at least, that's what I've learned so far in my limited experience). Always willing to learn new things and skills from more experienced players. Usually pilot Heavy and Assault mechs. Prefer Clan mechs (Mad Dog Revenant and Highlander IIc). I typically keep a distance early in the game, sniping or missile-boating, and get in a little closer with energy weapons later in the game. Casual player but open to play competitive FP on occasion. I haven't played FP yet. Work Mon-Fri, usually till about 6:00 pm (~1800). I'm looking for a casual unit. Looking for older players that are more mature and don't have sensitive feelings. A unit with players from the U.S. and/or Europe. I appreciate any help that's offered and if you have any questions just ask. I can be contacted either here or on Discord: Sheldrix#8720. Edited by Wolffhauser, 16 April 2019 - 09:15 PM.